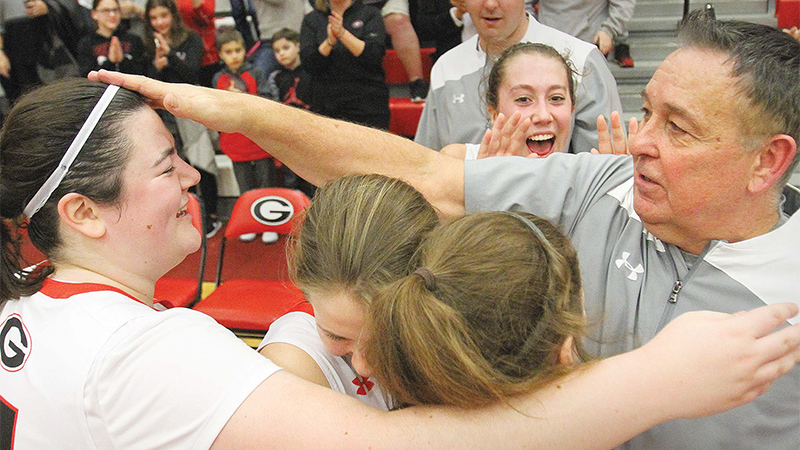 The win marked the 400th of head coach Andy Saxon’s coaching career. Published January 23, 2018 at 12:00 a.m. Updated January 23, 2018 at 6:26 a.m.
Wins have been at a premium this season for the Girard girls basketball team. They’ve been non-existent on the road for Lakeside. Lindsey Cave scored 16 points as Girard (4-11) posted a 43-25 win over the Dragons Monday. Saxon is in his 33rd season as a head coach, all at his alma mater. “It’s big anytime you win, but this is one that I will remember for quite some time,” Saxon said. “I don’t remember the losses, but I sure do remember all the wins. A triple by Lakeside’s Makenna Condone broke a 5-5 deadlock in the opening frame and helped the Dragons (1-14) to the early 8-5 advantage eight minutes into the contest. Ciminero notched six of her 10 points in the second frame, Sophie Griffith added five more and the Indians (4-11) opened a 24-14 lead at the intermission. They never looked back as they broke a two-game tailspin and moved to 3-5 at home. “It was very important for us to win this game for Coach,” Ciminero said. “We were committing too many turnovers early in the season and he told us to keep them to a minimum, play hard and have fun. A bucket by Cave gave Girard a 28-16 lead 43 seconds into the third quarter, increasing the margin to 39-18. Cave scored the next nine points to key a 13-2 run before settling for a 39-22 lead with a period to play. Of the seven combined points scored in the final quarterall came from the foul line except for a hoop by Lakeside’s Shayla Christian. The Indians forced 20 Dragons turnovers and limited Lakeside to nine field goals. If the Indians struggled anywhere, it was at the free-throw line where they converted just eight of 21 attempts. Christian led the Dragons with six points. February 11, 2016 12:08 a.m.
March 5, 2015 12:06 a.m.
February 1, 2015 12:05 a.m.
February 7, 2014 12:05 a.m.